3365 Armchair. Momentum, Kudos, Rolling Stone (YFS9) with with Chrome (CHM) legs. 3874 42" Round Table. White (WHT) with Chrome (CHM) legs. Let's have lunch in today. Whether it's a working lunch with the team or the customer is coming in on short notice, let Caprice seating and Wind tables create some of that new resto style at the office. Table tops are offered in vast range of sizes and shapes. 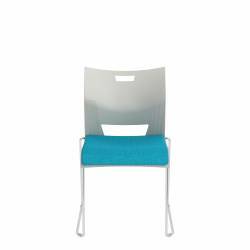 6623 Armless Chair, Upholstered Seat and Polypropylene Back. Ivory Cloud (IVC) with Arc-Com Grid, Sky (61247). 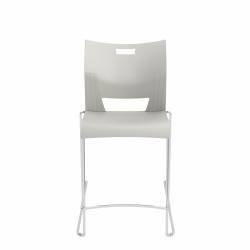 6661 Armless Height Stool, Polypropylene Seat and Back. Latte Beige (LAB). 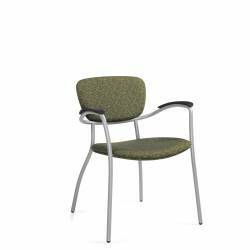 Bases are available in various seat heights and with a square or round base shape. Top to bottom every time. It's a simple thing done right. The right proportions. Flawless surfaces. Perfect structure. Squares or rounds at the floor with a gentle float. With all the popular sizes and heights to choose from, Swap is the table program that is sure to become your favorite spec. 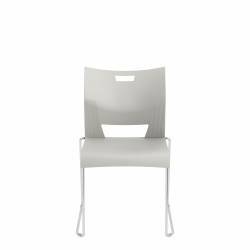 6711 Armless Chair. Latte Beige (LAB), Ivory Clouds (IVC) and Lip Smacker (LPS). Table with Chrome pedestal base and leveling glides. White Chocolate (WHC). We're good at stretching budgets. There are always times when budgets have to be stretched and solutions found. Popcorn seating combined with our classic Cafeteria tables are hardworking products that are offered in an array of contemporary colors and finishes to look your best. 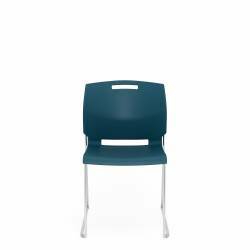 6621 Armless Chair, Polypropylene Seat and Back with sled base. Ivory Cloud (IVC). CAS30 30" Square Cafeteria Table. Avant Honey (AWH). Let Duet transform your cafeteria. Cafeteria seating takes a lot of use and abuse over time. Duet seating in ten great colours can provide a quick and contemporary facelift that can withstand the wear and tear of the most demanding environments.